If your Dad or husband is looking for new clothing this Father's Day, look no further than Fila Golf apparel! Their clothing is SO COMFORTABLE and both my husband and I are loving our Fila Golf Apparel that we received for review! Fila Golf is a men’s and women’s apparel line internationally recognized for its authentic sports heritage and exclusively licensed by Fersten Worldwide (FW). Heralding the sleek lines at the root of the Fila brand for nearly a century, the latest golf styles emphasize timeless sophistication, luxurious fabrics and technical characteristics. Mixing solids, stripes and textures, the looks build on the brand’s famous Viva Red, White and Fila Navy color combination. 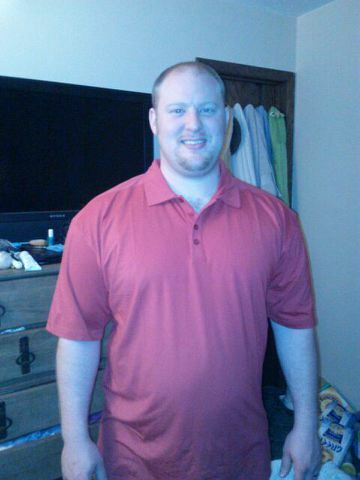 Like I mentioned, my husband LOVES his new California Polo! The California Polo ($60.00) is a Moisture Wicking & Anti-Bacterial polo with shirt collar, shoulder and sleeve panels, tonal FILA logo embroidered on left sleeve, imported. And the material is the softest, most comfortable material he owns for any shirt! The minute he put it on, he didn't want to take it off. It was so breathable and light - perfect for the heat and humidity we get in the summer! The anti-bacterial finish is highly effective for eliminating bacteria causing perspiration odors, and has excellent washing durability. This fabric feature draws moisture and sweat away from the body by transferring it to the fabrics’ outer layer, allowing it to evaporate quickly. The wicking fabrics dry very rapidly, keeping you cool, dry, and comfortable during any activity. And I am loving the Calgary Bermuda Shorts that I received. At first at first glance, I didn't think they were my style. But when I put them on, they fit in all the right places, were made of the softest material and were so COMFORTABLE! They fit perfectly and are so versatile...you can either dress them up or wear them around the house for an airy, comfortable feel! Calgary Bermuda Shorts ($80.00) are Flat front Cotton Sateen relaxed-fit shorts with two welt front pockets and two back flap pockets with button closure, F-box patch logo sewn above the right back pocket. I love that they are offered in so many colors...and I wish I would have been more adventurous and picked a more fun color than black. But these will be great for so many outfits this summer! So if you are looking for clothing for your father this Father's Day, make sure it is the comfortable, breathable, and versatile clothing from Fila Golf. They aren't just for golfers...just for people who love comfort! Buy It: You can purchase all Fila Golf Apparel from the Fila Golf online shop.